As I noted Set Points, Settling Points and Bodyweight Regulation Part 2, although I’ve been using bodyweight/body fat during this discussion, it’s probably more likely that it is body fat levels per se that are being regulated. Today you’ll see why and from here on out I’ll only talk about bodyfat regulation. 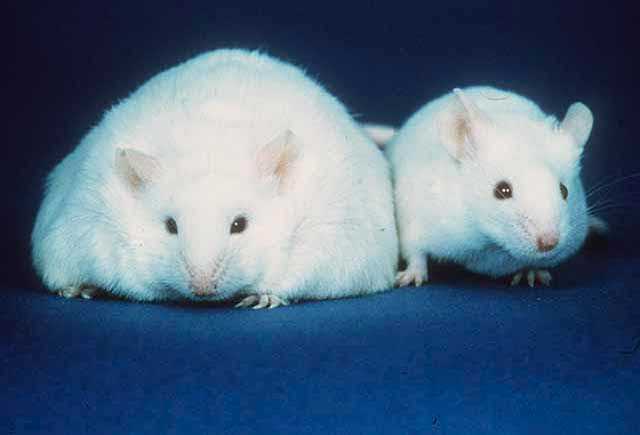 With early research (I’m talking the 1950’s) having established the existence of some type of setpoint (again, primarily in animal models), early researchers had to sort of guess what might be going on in terms of regulating body fat levels. Essentially they postulated that the brain of the animal must be responding in some form or fashion to a hormone that scaled with body fat levels. They could only postulate what it was and it would take another 40 years before a major candidate would make itself known. In 1994, the gene for a hormone that would eventually be called leptin (from the Greek “leptos” for thin) was discovered in the OB (OB stands for obesity) mouse. The OB mouse had been studied for decades and was spontaneously overweight with a low resting metabolic rate, low levels of activity, etc. It ate a lot, put on fat easily, etc. Here’s what it looks like compared to a normal lean mouse. Superficially, the OB mouse appeared to be similar to obese humans (except furrier). It turns out that the OB/OB mouse doesn’t produce leptin at all, it has a gene defect and makes zero leptin. Inject it with synthetic leptin and it loses weight rapidly. After the discovery of leptin, the news was abuzz with thoughts that the cure for obesity was finally here. Companies spent a lot of money getting the rights to leptin, thinking it would fix the global obesity problem and they’d make zillions of dollars. So researchers went about measuring blood levels of leptin in humans of varying weight expecting obese humans to produce no leptin. To their dismay, it turned out that obese individuals invariably had very high levels of leptin and it was suggested that, in a similar vein to insulin resistance (where the body no longer responds appropriately to the hormone insulin), the body or brain had become leptin resistant. 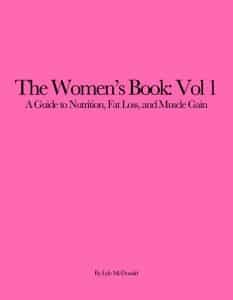 There was plenty of leptin floating around but it wasn’t sending the right signal to the brain to turn off appetite and reduce body fat. I’d note in this regards that two other rat strains, the DB (for diabetic) and DIO (dietary induced obesity) rat show varying degrees of leptin resistance (the existence of resistance to the supposed regulating hormone was also postulated back in the 50’s). In the case of the DB rat, it’s complete and genetic; in the DIO rat it develops with increasing obesity. A variety of things induce leptin resistance including high blood triglyceride levels and even leptin itself; when elevated chronically, leptin induces resistance to itself. I’d note that it is currently being debated if leptin resistance is truly the cause for what’s going on and other models, such as the leptin insufficiency theory are being discussed as well; in this concept, a lack of leptin in the brain (but not in the body) is the problem. In either case, the signal from leptin isn’t being sent properly. I’ll talk about what that signal is in the next post. And while a handful of individuals have been found who produce no leptin (and who respond to injectable leptin with massive weight loss and a normalization of metabolic rate), studies which injected leptin levels in the obese showed disappointing or no weight loss. Which doesn’t make leptin useless, mind you; it was simply being used incorrectly because researchers didn’t quite understand what it was actually doing or supposed to be doing. Many people still don’t. Before wrapping this up, I want to note that leptin isn’t the only candidate hormone for body weight regulation; as it turns out insulin is also a key player here (insulin also scales with bodyfat). Direct injection of insulin into the brains of animals reliably reduces food intake and bodyweight. There is also evidence, which I’ll discuss later, that there is a gender difference in how the brain responds to either leptin or insulin. Given that leptin scales mostly with subcutaneous fat (generally higher in women) and insulin scales mostly with visceral fat (generally higher in men), this will turn out to make some logical sense. Of course, there are other factors here as well. Hormones such as cholecystokinin, peptide YY, ghrelin as well as blood glucose, blood fatty acids, amino acids, and others being discovered damn near daily are all sending an integrated signal to the brain about what’s going on in the body. As well, varying hormones work on relatively longer or shorter time frames. For example, insulin can change in a matter of minutes, leptin may take hours, ghrelin operates on a meal to meal basis, etc. This makes for a very complicated system. But I’m getting ahead of myself. Oh yeah, it goes without saying that most of this information is discussed to one degree or another in almost all of my books. There are links to individual ones on the side rail or you can go to the store.